This tutorial will illustrate how you might build a graph editor interface using Piccolo. Moving the mouse over a node will highlight that node. And, dragging a node will move that node around, keeping the edges connected. In this example, we will use the PPath node provided by Piccolo for both our nodes and edges. Rather than creating our own data structure to keep track of the connections, we will use PNode's Tag property in .NET and its getAttribute and addAttribute methods in Java. Both of these mechanisms provide the ability to attach extra information to a node without subclassing it. 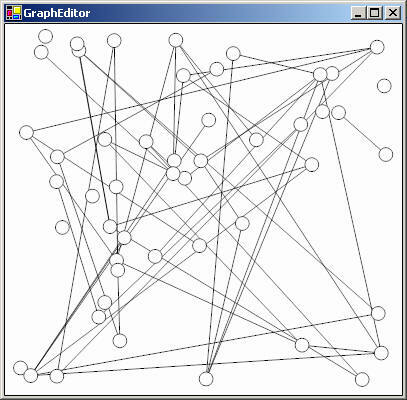 For each node in the graph, we will attach a list of its connected edges. And for each edge in the graph, we will attach a list of its connected nodes. We will then create a reusable GraphEditor component that extends PCanvas. This component will add the nodes and edges to the scene-graph. We will also create an event handler class to drag the nodes and update the edges. Finally, we will create a wrapper window called GraphEditorTester and add our new component to the window. We will make a reusable component that extends PCanvas and initializes the graph. We extend PCanvas and add some random nodes and edges. Add the following class to your project. // Make sure we have two distinct nodes. // when determining their position. First we create some randomly positioned ellipses, for our nodes. Next, we need to attach a list to each node, to store the connected edges. Piccolo.NET provides the ability to add an object reference as a tag whereas Piccolo.Java uses a set of named attributes instead. In the Java version, we use addAttribute to attach an ArrayList. In the .NET version, we set each node's Tag property to an ArrayList. Next, we create some lines for our edges. Note, we use a separate layer added underneath the main layer, to insure that the nodes are always on top. For each edge, we randomly choose two nodes to connect. We add the edge to each node's list of edges and we add the nodes to the edge's list of nodes. The UpdateEdge method is called to position the line's endpoints to the center points of each node. Finally, we add an event listener, defined below, to make our graph interactive. We will create an event listener class to handle all of the interaction of our application, including highlighting and dragging nodes. We extend PDragSequenceEventHandler to create an event listener that performs some operation during a drag sequence. Add the following code to your project. For the Java version, you should add the anonymous event listener class to the constructor. When the mouse enters a node, we set the node's fill color to red to highlight the node. When the mouse leaves a node, we set it's fill color back to white. We only do this when no mouse buttons are pressed because we don't want to highlight a node when the mouse is dragged overtop of it. And, we consume the drag event, so that we will not pan when a node is dragged. We also need to update the edges. During a drag sequence, we iterate over the dragged node's edges and call UpdateEdge on each one. Recall this method gets the two nodes each edge connects, and then repositions the edge to the center points of each connected node. Now we are ready to add our new component to the window. We create a JFrame in Java or a Form in .NET as a wrapper for our component. Add the following class to your project. First, we create an instance of our GraphEditor component and add it to the form's list of controls. Then, we anchor or new component to the sides of the window, so that it will get resized when the window is resized.